With the lyrics of a Replacements song running through his head ("Look me in the eye, then tell me that I'm satisfied"), David Giffels—with his wife and infant son in tow—combs the environs of Akron, Ohio, in search of the perfect house for his burgeoning family. The quest ends at the front door of a beautiful but decaying Gilded Age mansion, the once-grand former residence of a rubber-industry executive. It lacks functional plumbing and electricity, leaks rain like a cartoon shack, and is infested with all manner of wildlife. But for a young father at a coming-of-age crossroads, the challenge is precisely the allure. 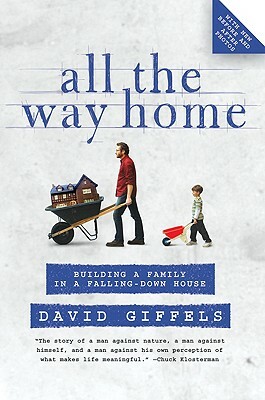 All the Way Home is Giffels's funny, poignant, and confounding journey through the great adventure of restoring a crumbling house on the way to discovering what the words "grown up" and "home" really mean. David Giffels is an assistant professor of English at the University of Akron, where he teaches creative nonfiction. Formerly an award-winning columnist for the Akron Beacon Journal and a contributing commentator on NPR, his writing has appeared in the New York Times Magazine and many other publications. He lives in Akron, Ohio, with his wife and two children.